A pretty sunset is a pretty sunset, and at this time of year when warm colors abound throughout the garden as well as the sky, I can sit back on the deck and imagine I’m just where I want to be. Squinting really hard makes all the white vinyl fencing disappear, the hill on the left is no longer the super Walmart access road, and the distant lights no longer illuminate the Home Depot truck lot. A small patch of water reflects the colors of the sky and from this far away it’s not a puddle from industrial park construction, but instead a scenic duck pond. Now if I could only get rid of that stupid beeping noise the trucks make when they reverse….. 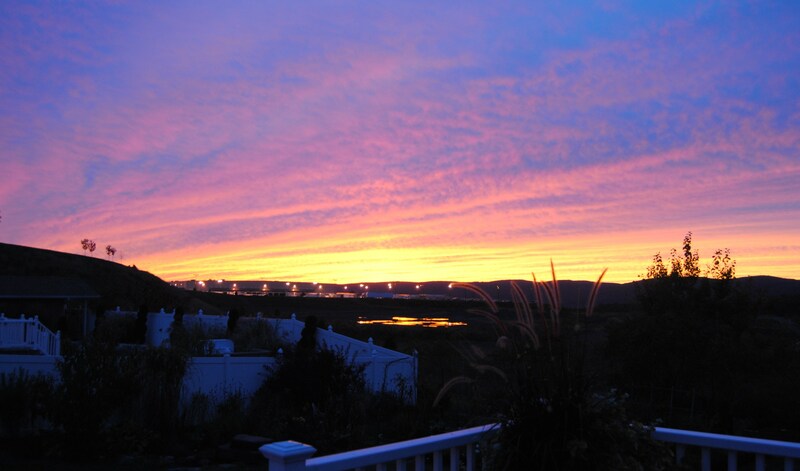 This entry was posted in fall, garden stories and tagged suburbia, sunset. Instead of borrowed scenery you have re-imagined scenery, eh? Best wishes for your colchicum talk! And where would you like to be? Good thing to be able to dream and phantasize and something we should never forget. I really shouldn’t complain, it’s a nice spot here and could easily be much worse. I always imagine the neighbors of my parents who put in a basketball court… thump thump thump… plonk swish… repeat all evening 100 feet from the back patio. I really don’t know where I want to be! I’m pretty happy here for the time being, I just find it ironic that we live near so many rural and wooded areas yet ended up neighbors to industry, highway, airport and train. I’d much rather overlook a fog shrouded castle! You’re welcome to visit my blog for the view of the castle ;). Puh, basketball court! They should have put in a nice garden, don’t you think! sure…. at least these geese don’t leave behind any calling cards. It is nice to fall into imagination to make the ‘crap’ of the world disappear. It it were only that easy right? I’d jump on it. Really lovely, vibrant photos. Thank you for the like on my About the Wayfarer. Cheerleading your way.